Home /Social Networking » Can the new Myspace recapture the mainstream user? Can the new Myspace recapture the mainstream user? This week, embattled social media network Myspace took the wraps off its revamped network. But unfortunately for the former social media heavy-weight, the launch of the new Myspace was largely overshadowed by the announcement of Facebook’s new search engine, Social Graph. Many sceptics are wondering whether Myspace will ever enjoy mainstream use again. Back in the early 2000s, Myspace was an incredibly popular social network among young people and music enthusiasts. At the height of the network’s success, it was sold for $580 million. Since then it all but disappeared into oblivion. Now, new investors, including Justin Timberlake, are hoping the network can make a comeback. My Space or Justin Timberlake’s space? As if the overshadowing of Myspace’s relaunch by the release of Facebook’s Social Graph was not enough, Timberlake (one of the network’s investors) did some overshadowing of his own. Upon visiting the site, users were greeted with large picture of Timberlake. 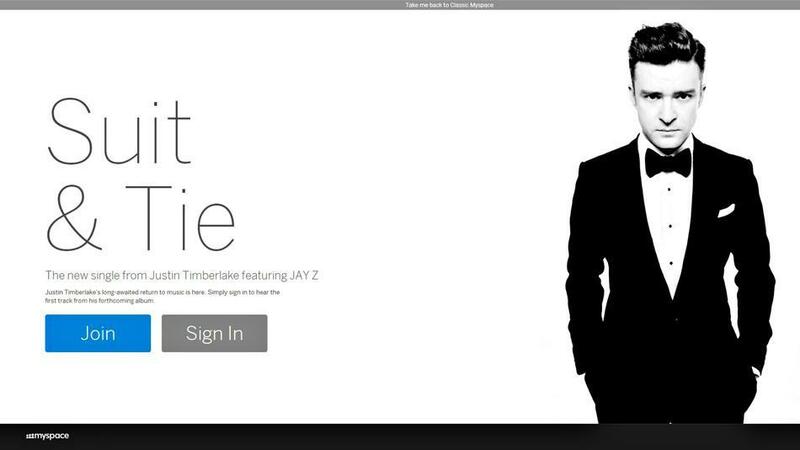 Following the login or sign up process, visitors were again greeted with Timberlake’s face. Big captions across the site’s pages also made mention of Timberlake’s new single, “Suit & Tie”. The move drew a lot of criticism on social network Twitter and news sites, including this humorous response. Many users also complained that they were unable to connect with friends through a search feature, although they could connect with strangers. While many features are still reportedly in development, connecting with friends seems an obvious and essential feature for a social network. Myspace may have done better to wait until all the technical kinks were ironed out before launching the revamped site, instead of compromising usability in order to coincide with Timberlake’s new single. Despite the criticism, the new Myspace has been praised for its cleaner interface, intuitive design and a welcome lack of advertising. As mentioned earlier, many people have questioned the ability of Myspace to gain traction with users, given the social network’s fall from glory and the number of social networks competing for user time. However, MySpace COO Chris Vanderhook has insisted in the past that Myspace is not hoping to compete with the likes of Twitter and Facebook, and that the network is focused on music discovery.The question then, is whether Myspace will be able to position itself as network to discover new music, competing with the likes of Spotify and iTunes. Before people dismiss Myspace, they should remember that new social networks continue to achieve success (take a look at Pinterest for example), while the existence of Flickr did not stop the success of Instagram. Many youngsters are also completely unfamiliar with the old Myspace, presenting a great opportunity for the revamped network if it can catch the attention of this new generation. This should not be too difficult given that the network is focused on connecting musicians with their fan base and today’s young generation is obsessed with fame and sharing their experiences. If Myspace is able to drive music discovery, it may well achieve success. Of course, the folks at Myspace will need to address technical hiccups on the site and Justin Timberlake will need to take a back seat. WSI is an experienced Internet marketing company that can help you develop a social media strategy that drives engagement with your target audience. To learn more about how WSI can help you increase your social media presence, contact us today!